Monday, 4/22 9:00 a.m. – 6:00 p.m.
Tuesday, 4/23 9:00 a.m. – 6:00 p.m.
Wednesday, 4/24 9:00 a.m. – 6:00 p.m.
Thursday, 4/25 9:00 a.m. – 6:00 p.m. 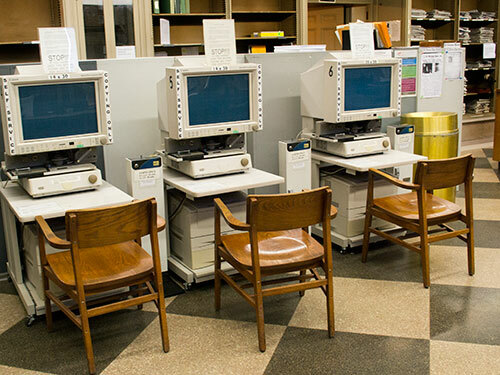 The Newspapers & Microfilm Center is our region’s largest collection of newspapers from the Philadelphia metropolitan area. Over 400 newspapers dating back to 1720 are on microfilm . Our collection includes newspapers from major cities around the world, local community papers, as well as microfilmed versions of academic, underground, and trade periodicals collected by the subject departments. Students and the curious should begin their research process by inquiring within the Social Science & History Department. Philadelphia Daily News (1978 - present). Unfortunately, coverage between 1978 - 1981 is incomplete. Philadelphia Inquirer Digital Archive (1860-2001). Full page PDF scans of the original paper. New York Times at the Library does not provide access to articles 1923 - 1980 (speak with librarians for assistance). New York Times Anywhere provides access to 5 articles from 1923 - 1980 with each 72 hour pass. Instructions. Independent Voices : a free and Open Access Collection of Alternative Press (1950 - 2016) can be an important source for underground, counter-cultural, or other independent perspectives from this time period. Microfilm or major clippings collections can be a serious alternative access point for research. Many of the subject departments at the Central Library maintain clipping files that can often act as an index to this period. Inquire at each department's reference desk. Temple University's Urban Archives includes the George D. McDowell Philadelphia Evening Bulletin News Clippings Collection, which is currently the best index to this time period in Philadelphia. Every newspaper published at or before 11:59 pm on December 31st 1922 is almost certainly in the public domain, which makes it legally simple for others to scan, store, and make the oldest newspapers searchable. The task, however, is expensive. Some companies, institutions, governments, and individuals have taken on the task. The Philadelphia Inquirer (1860 - Present) is an excellent source of news from Philadelphia for this time period. And it is a useful source of national and sometimes international news. Fultonhistory.com described in detail above in the "Newspapers 1923 through late 1970s" section can also provide access to papers in the nineteenth and early 20th centuries. TDNet is the tool for researchers to use to determine which databases provide electronic access to periodicals. Search a newspaper (or magazine) by title, and TDNet will tell you which database(s) to which we subscribe provide full text. TDNet is an imperfect tool, if something seems missing consult with a librarian for assistance.